The oak across from my driveway has leaves the color of a once red, weather-worn 57′ Chevy parked behind an old farmhouse. I studied it as I walked down the driveway from a morning run, knowing there was more to this oak tree than met the eye. The day before, I had stood beneath its branches, amazed by what I saw. The sun was up past the trees on the other side of the soybean field and the sky was bright blue. One more step took me beneath the branches and I turned my face up to the canopy of leaves. 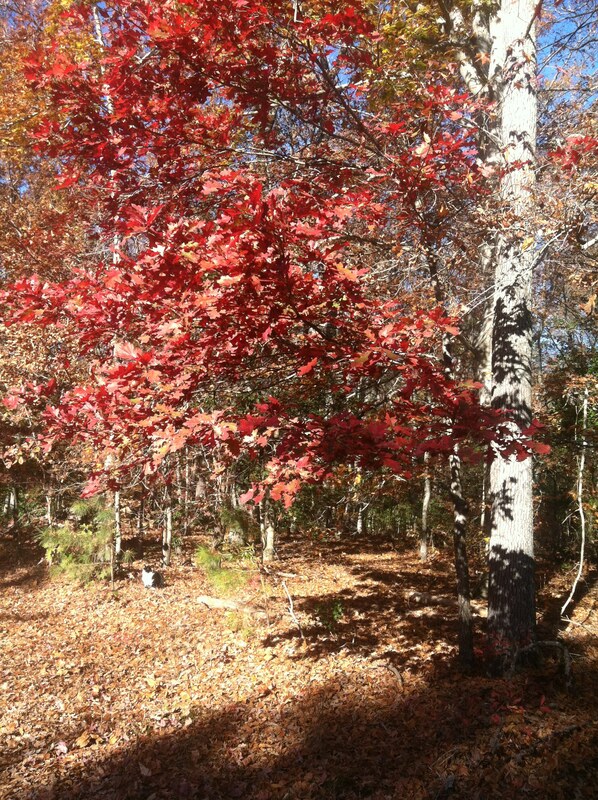 Sunlight streamed through the rust colored leaves, turning them into rubies blazing forth with scarlet light. Just as it had been yesterday, the view gazing up from below was dramatically different than the one from the side. I walked back and forth several times to see the change. 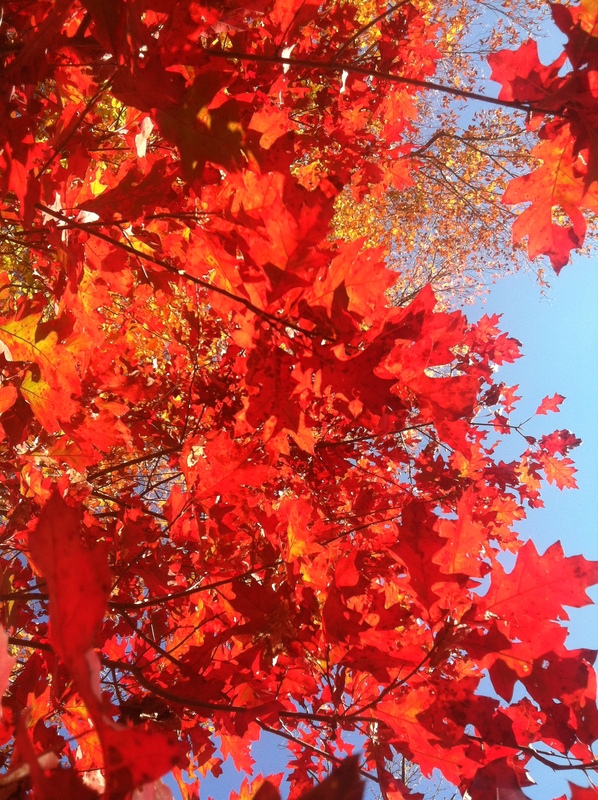 Each time I came in beneath the branches and looked up, the glorious red leaves filled me with wonder. The difference between dreary and magnificent was just a matter of perspective. A few steps in and an upturned face positioned me to see glorious color and beauty that could easily have been missed. I could feel a lesson in the making. The challenges and tribulations of this life often cover over our souls like rust on old metal. We feel dingy, worn and fragile. It’s not just the big blows that hurt and wear us thin but also the day to day trials and struggles that beat incessantly on our energies and attitudes. It’s then we need to bend low, humble ourselves and creep in under the overhanging shelter of our God, and look up to see His face. How do you really do that? Tell Him you know you can’t fix what’s wrong, and that you can’t cope by yourself. Ask Him to forgive you for wondering WHY, instead of looking to see WHAT He wants you to learn. Stay close to Him in prayer, seeking to follow Him through it all and expecting to see His glory come about. Your world might be raging, but He holds the Universe in His Hand. His plans for the world and for you will not fail. He keeps His promises. He wants you to focus on the rubies, not the rust. Following Him means you need to stay close, so you don’t get off track. Camp beneath the overhanging branches of God’s shelter by studying Jesus and how He lived His life. He set the pattern we are to follow. Read Matthew, Mark, Luke or John and pray to understand the character of Jesus so that you have in your sights how to be. Know you can be like Him because if you are a child of God, Jesus lives in you, and you operate in the power of the Holy Spirit. In Him, stomp down all the parts of you that get in the way, to make room for the parts of Him that want to fill you up. Bend low, get close and look up. Worship Him, because who He is never changes. He is the Artist who created you; He is Lover of your soul who died so you could live; He is Always, Forever and Almighty. He is Craftsman and Conductor of your life. The rubies of His glory exist even in the rust of life. Get in position and ask Him to help you see your circumstances with a different perspective. The world can rage. The rust invades, but He is God. Nothing happens outside His plan. He will not desert you, but if you move away from Him the rust can overtake you, and the rubies fade out of view. Follow the character tracks of Jesus to the shelter of the Father. Jesus left clear prints that lead the way. Follow and pray for wisdom to view life from His perspective. Bend low, get close, look up. Then, encourage someone else to do the same.